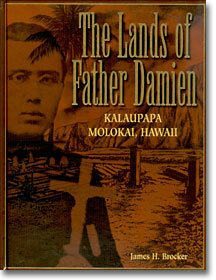 The Lands of Father Damien 1998 "Best Seller" Award recipient. Written from the heart by long time Molokai resident James H. Brocker, The Lands of Father Damien is a stunningly narrated and photographed hardcover book that portrays life, past and present, at the tiny and remote Kalaupapa Peninsula like no other before it. Foremost among those who came to bring compassion and assistance to the men, women and children who were exiled to this land was a man who was to achieve greatness by his humble efforts to relieve and ultimately share their pain. This priest is known to the world as Father Joseph Damien deVeuster. As the last of his flock and the 20th century fade into memory, the tragedy that occurred here is left as a reminder of man's injustice to his own. The chronicle of loneliness and suffering within the pages of this book belongs to each and every one of those banished to the Kalaupapa Peninsula over the decades and it is for them that this story is told. One of many reviews: "Congratulations on The Lands of Father Damien. It was excellently done from cover to cover, photograph to photograph, and page to page! You have done a wonderful job throughout. Everything was beautiful. So much so that I doubt if there will ever be another book this good or even similar to it. I feel really honored, proud and privileged to have a copy of your work. I know that most if not all the people at Kalaupapa were very impressed with what you have done. I believe that whenever they show or talk about your book nothing but good things can be said. Again, my congratulations and mahalo a nui loa for a beautiful book portraying 'our stories', past and present, in words and photographs. I wish you much success with this book and your future endeavors and thank you for remembering 'us' that for years were shunned." A Hansen Disease patient at the Kalaupapa Settlement.